The first cable laid for the Danish PTT was across the Belts; R.S. Newall & Company laid the 15 nm cable in 1853. The core was manufactured by the Gutta Percha Company and the armouring carried out by Newall's. In 1860 the W.T. Henley Telegraph Works Company were awarded a contract to lay two14 nm cables across the Great Belt. Over the following years most of the islands were connected to the mainland by cable and landline. In 1902, working to a design by C. E. Krarup, the first loaded cable ever produced was laid between Elsinore, Denmark - Helsingborg, Sweden. Krarup was the chief engineer of the Danish PTT and his work was based on the researches of Oliver Heaviside. Norddeutsche Seekabelwerke manufactured and laid a 25nm cable between Warnemunde, Germany and Gedser, Denmark in 1926 using CS Norderney. The same company using the same ship laid a further two cables in 1931, one between Ystad, Sweden, and Bornholm, 35 nm in length, and the other between Barsebeck, Sweden, and Charlottehund, Denmark, 12 nm in length. The last international telegraph cables were laid between Bornholm and Poland in 1943. 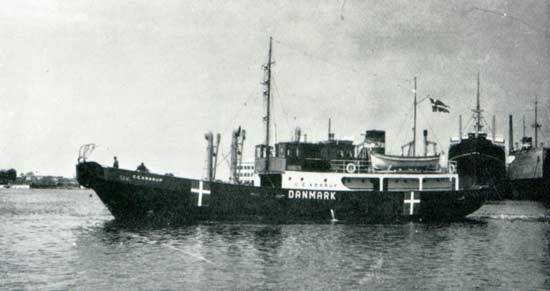 In 1940 Norddeutsche Seekabelwerke manufactured and laid a co-axial telephone cable between Hirtshals, Denmark and Arendal, Norway, again using CS Norderney. 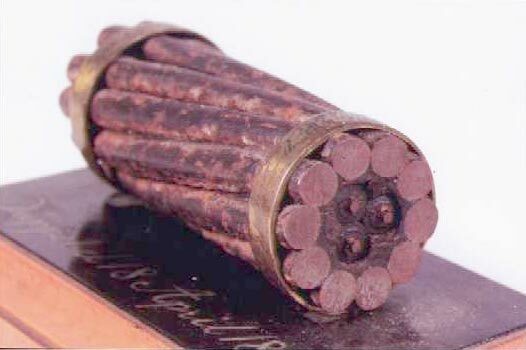 Three repeaters, manufactured by Felten and Guilleaume, were inserted in this cable in 1956, increasing capacity to 60 circuits. In the same year Submarine Cables Ltd manufactured and laid a cable of 69 nm containing two repeaters between Thisted, Denmark and Kristiansand, Norway. CS Ocean Layer on her maiden voyage as a cable layer undertook the work with CS C. E. Krarup (2) laying the shore ends. Two cables were laid between Römo, Denmark, and Leeuwarden, Netherlands, in 1950, one manufactured by Telcon and the other by Submarine Cables Ltd. Each cable was 142 nm in length and contained two repeaters manufactured by Standard Telephones and Cables Ltd. HMTS Monarch (4) laid the main cables with CS Poolster (2) and CS C. E. Krarup (2) laying the shore ends. In 1956 the two repeaters in one cable were replaced by seven others, the work being carried out by CS Alert (3) and CS Poolster (2). In 1961 similar work was carried out in the other cable, this time by CS Peter Faber (2). Standard Telephones and Cables Ltd manufactured the fourteen repeaters, and the two cables were owned jointly by the Danish and Netherlands PTT. 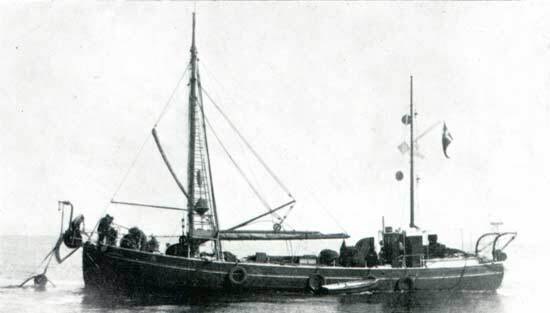 A 183 nm co-axial cable with six repeaters was laid in 1956 between Esbjerg, Denmark, and Den Helder, Netherlands. Manufactured by Cables de Lyon with the repeaters by La Compagnie Industrielle des Téléphones, installation was carried out by CS Ampere (3). The Danish PTT was part-owner of the Denmark - Poland cable laid in 1960, full owner of the Avedore - Bornholm section and joint owner of the remainder. The SCOTICECAN cable was also in partnership with others. The PTT entered into two joint projects with the GPO - first was the Lerwick, Shetland Islands - Thorshavn, Faroe Islands, manufactured by Standard Telephone and Cables Ltd, consisting of 230 nm of cable with 27 repeaters,CS John W. Mackay laying the cable. The second joint project, laid in 1973 by CS Alert (4) between Scarborough, England, and Thisted, Denmark, consisted of 381 nm of cable with 60 repeaters, manufactured by Submarine Cables Ltd. In 1980 England - Denmark No. 3, a cable 301 nm in length, was manufactured and laid by Standard Telephones & Cables Ltd. CS Vercors laid a 123 nm cable between Denmark - Holland in 1983. England - Denmark No 4, manufactured by Standard Telephones & Cables Ltd., was laid in 1988. The cable was 640 km in length, a joint venture with BT. 1989 saw a 150 km cable laid between Denmark and Bornholm. Two cables were laid in 1991 between Hillerod, Denmark, and Helinsborg, Sweden, No. 15 & 16, each of 15 km. In the same year a joint venture with Polish Telecom saw cable No. 2 laid between Poland and Denmark. In 1992 Standard Telephones and Cables Ltd manufactured a cable running between Ajorring, Denmark - Arendal, Norway, No. 5, a distance of 130 km. The following year cable No. 6 between Phisted, Denmark, and Kristiansand, Norway, was laid. This was followed by a 293 km cable between Denmark and Germany. A second cable over this route was laid in 1993. In 1993 another joint venture, this time with Great Northern, involved a 1250 km. fibre optic cable manufactured by Standard Telephones & Cables Ltd and laid by MV Dock Express 20, between Copenhagen, Denmark, and Kingiseppe, Russia, where it transferred to a microwave link to Moscow and St. Petersburg. CANTAT 3 laid in 1994 included a landing at Blaabjerg, Denmark. ODIN laid in 1995 linked Denmark - Holland 468 km, Denmark - Norway 302 km and Norway - Sweden 220 km. The BALTICA cable, laid in 1997, ran from Poland via Bornholm 105 km and on to Sweden 102 km and from Bornholm to Denmark 230 km. The 1998 DANICA South and North system consisted of two short cables linking Sweden and Denmark, 20 and 25 km in length respectively. STORE BÃLT ran from Korsõr, Denmark - Nyborg, Denmark a distance of 30 km and was laid in 1999. The year 2000 saw an England - Holland - Denmark cable laid, and in the same year the SCANDINAVIAN RING NORTH and SOUTH network linked Sweden and Denmark with two cables, 17 and 20 km respectively. Also laid in 2000 was FEHMARN BÃLT from Puttgarden, Germany to Rõdbyhavn, Denmark cable length 20 km. The last of the cables laid in 2000 was PANGEA linking England, Holland and Denmark. The 942 km cable was manufactured by ASN. In 2001 TAT 14 ran from Tuckerton and Manasquan, USA to Blaabjerg, Denmark and then on to Norden, Germany, Katwijk, Holland, St Valery en Caux, France, Pentewen and Widemouth Bay, England and then back to Tuckerton, USA. Constructed of larch and oak and was equipped for sailing but was also fitted with an engine. Used up until 1946 on repair work. Lengthened in 1924 to 65.6 ft which increased her tonnage to 43. Originally the steam launch for the cruiser Valkyrien. Used from the 6th October 1925 until 25th September 1930 on cable repair work and then declared unseaworthy. Two separate combined paying out and picking up machines were fitted each with their own electric motor which were controlled from the upper deck. Twin 5 foot diameter bow sheaves were fitted. Cable, capacity 6180 cubic feet, was stored in the hold not in a traditional tank. Sold out of the cable world in 1962 and renamed Navigator. CS Peter Faber (2) repairing cable. Shown above the bridge is the international signal used by cable ships when laying or repairing cables - two red discs with a white diamond between them. At night two red lights with a white light between them are displayed. Launched 6 December 1960 and completed March 1961. Fitted with twin electrically driven paying out and picking up gear, and the ship has one cable tank 23 feet diameter by 15 feet high. Space is also available for storing drums of cable. Replaced in 1982 by Peter Faber (3). Sold in 1983 to the Hellenic Telecommunications Organisation and renamed Thalis. Sold for breaking up 11 September 2005. Based at Korsor for cable repair work. Strengthened for working in ice in Greenland. Now owned by Alcatel Submarine Networks Marine A/S. Built 1983 by Frederikshavn Vaerft A/S for K/S Merc-Skandia, Copenhagen, and named Mercandian Admiral II. 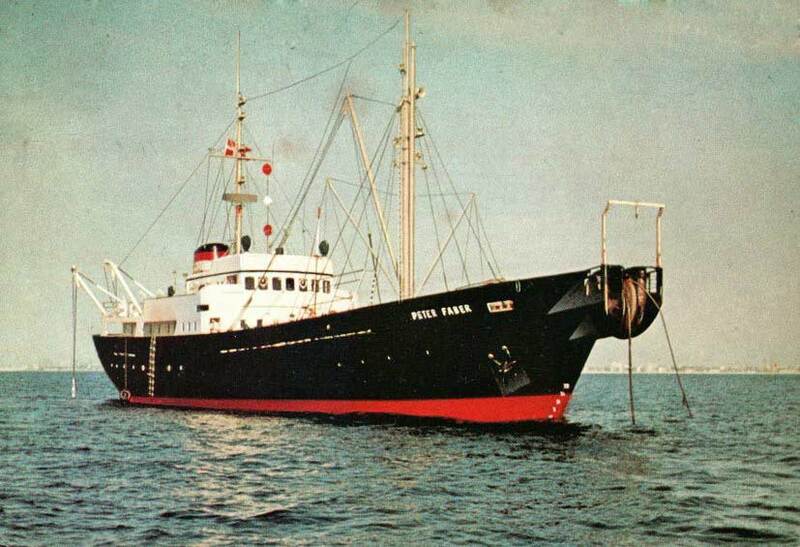 Renamed Ferrymar I in 1988 and then reverted to her original name in the same year. In 1989 renamed Heimdal by Scandlines A/S and used as a ro-ro ferry between Denmark and Sweden. Laid up in 1999 due to the opening of the STORE BÃLT bridge. 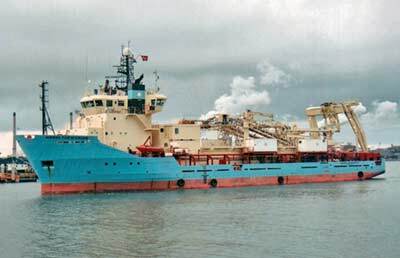 Bought by Tele Danmark International Marine for conversion to a cable ship. Orskov Staalskibvaerft, Fredrikshavn, carried out the work which started in September 1999 and was completed by April 2000. This involved rebuilding the stern with the port side funnel being relocated and the starboard funnel removed altogether. Chartered to Alcatel Submarine Networks for three years. The following cable ships are not owned by Tele Danmark but are Danish vessels and so are included here for convenience. Built in 1992 by Ulstein Verft A/S, Ulsteinvik. Built as an Oil Rig Support Vessel for A.P. Moller. Converted to a cable ship in 1994 which included fitting two cable tanks and two stern sheaves. Chartered by Tele Denmark until 2001 when the vessel was converted back to an Oil Rig Support Vessel. Built in 1996 by Ulstein Verft A/S, Ulsteinvik. Built for A. P. Moller as a cable ship. Built for A. P. Moller and converted in 1999 to a cable ship. Chartered by Global Marine Systems. for eight years on completion of conversion. 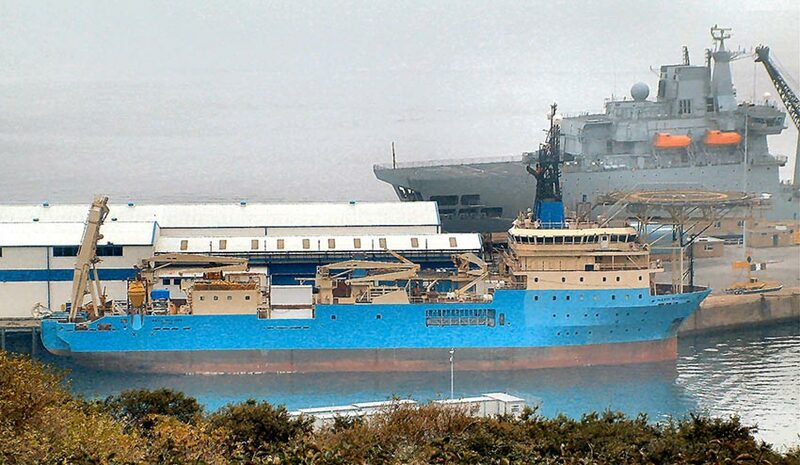 Four identical cable ships built for A. P. Moller and chartered to Global Marine Systems for a period of eight years. 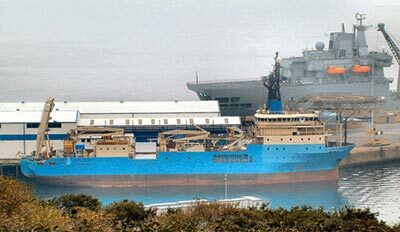 Capable of carrying 6000 tons of cable and 192 repeaters. 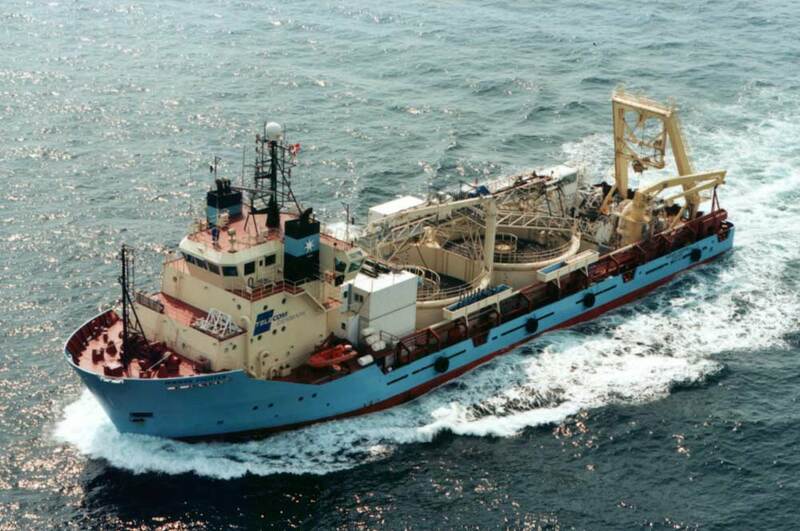 Maersk Reliance has been converted to an Offshore Supply Vessel (OSV) and renamed Rubicon Maverick (June 2007).